This is the place to be when hurricane swells roll into the South Padre coast. Please be sure to give the surfers some room. Advanced kiteboarding in the surf of the Gulf of Mexico, good for SE winds, use extra caution if riding with any north wind and avoid offshore winds. Best place to kiteboard, especially for beginners, or those working through a new move. Especially if you can get out early or on a slow day. However, often times it is so packed with kiters and windsurfers that it can be unnerving. Similar to the S. Flats with more room and no wind shadow. Be sure to rig up and kiteboard downwind of windsurfers. 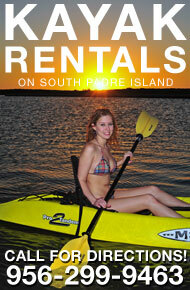 This is private property and requires the purchase of an annual pass through South Padre Island Windsurfing Association, cost is less than $20. This is the flats where we have been having the South Padre Island Races. An advanced kiteboarding area with barbed wire, cactus, and other hazardous debris along the shore. Definitely not the place to lose control of a kite. Use extreme caution. For the expert rider offers great wind if the Island has a SE wind that is too low. It is always blowing at Holly. Hazards - No cars or water or water craft allowed downwind of launch. Use launch and landing areas with no hard objects for at least 100 yds downwind. Preflight - Walk your center lines to the front (leading edge). All kites need a safety leash on the water and a sand bag on the beach. Beginners should launch and learn downwind of the main launch area. Test and practice your quick release. Launch with your kite at waters edge. Use experienced launchers, not spectators. Launch signal is "thumbs up", landing signal is "pat your head". After the launching your kite, keep it low and go! 12 o'clock or neutral position can loft you in a gust. Don't practice flying kites on land. Stay 100 ft away from kiteboarders, windsurfers, swimmers, surfers and beach users. Getting in close is not cool. No transitions or jumps within 100 ft of beach or directly upwind of others. Never rider under another kite. You should reverse direction or move downwind. Never fly your kite over anyone. Reverse direction or fly at 12 o'clock. Do not ride through windsurfers or surfers areas, instead reverse direction. Push the limits far away from others. Ride like Grandma upwind of others and near the shore. fishing boats and jetskies are fast, often intoxicated, and deadly silent when approaching, keep your eyes and ears open, look over your shoulder often. Don't ride farther from shore than you are prepared to swim with all your gear. Be sure you know self rescue techniques. Never wear a board leash, you should quit trying to ride and practice upwind body dragging!!! Leashes will hurt you! Never let let lines wrap around you. Use safety tools: lessons, kite leash, knife, quick release, helmet, impact vest and sandbag. Beach access is a privilege- Kiteboarding is already prohibited at numerous beaches throughout the world. Each kiteboarder must speak up and respectfully demand safe and courteous behavior from everyone. Dogs- Always on leashes and pick up after them. Jetties- rig and launch south of the north (2nd) pavilion. If the beach is crowded find a different place to rig and launch. DO NOT RIDE THROUGH THE SURFERS!!! !